The New Energy and Industrial Technology Development Organization (“NEDO”), Hitachi, Ltd. (TSE:6501/“Hitachi”), Hitachi Chemical Co., Ltd. (TSE:4217/“Hitachi Chemical”), Sumitomo Mitsui Banking Corporation (“SMBC”), Polskie Sieci Elektroenergetyczne S.A. (“PSE”), ENERGA-OPERATOR S.A. (“EOP”) and ENERGA Wytwarzanie S.A. (“EW”), supported by the Ministry of Energy of the Republic of Poland (“Poland”), announced earlier this week that they have agreed to jointly carry out a smart grid demonstration project. NEDO and the Ministry of Energy of Poland concluded a memorandum of understanding for the project to support the power system security in response to increasing share of renewables connected to the Polish power system. The project goal is to test on the assigned grid area functionalities of Special Protection Scheme (SPS) and hybrid Battery Energy Storage System (BESS) in order to increase power system security. The solution offered utilizes Japanese state-of-art network stabilization and battery storage technologies. In order to carry out the project, Hitachi, Hitachi Chemical and SMBC each will sign an entrustment agreement with NEDO. Alongside this, Hitachi and Hitachi Chemical today signed an implementation document to realize the project in cooperation with PSE, EOP and EW. As an EU member state, Poland plans to increase renewables energy ratio in its power system. In order to handle the additional burden on the electricity networks, essential work is required to upgrade and enhance the grid. This can be supported by utilization of advanced grid automatics such as SPS preventing the grid overloading and allowing for optimal management of renewables generation, especially wind generation. Decision on project execution in the next three and a half year is based on the results of a feasibility study conducted from February 2015 to November 2016 by Hitachi, Hitachi Chemical, SMBC and other entrusted companies. More specifically, Hitachi working with PSE, EOP and EW will build SPS solution while Hitachi Chemical will be responsible for provision of hybrid BESS equipped with lithium-ion and lead-acid batteries. In addition, Hitachi, Hitachi Chemical and SMBC will explore business models for network protection systems and battery energy storage systems. 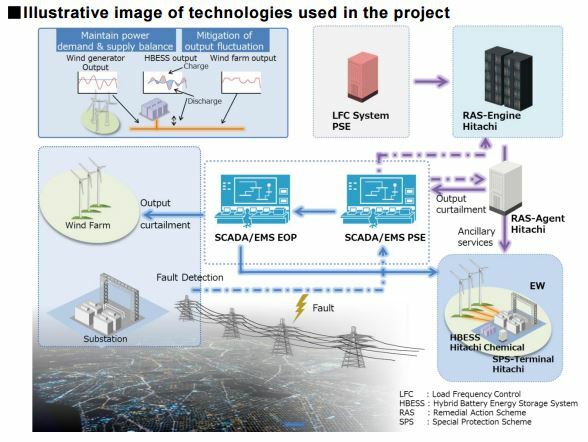 Special Protection Scheme (SPS) grid overloading prevention functions [Entrusted company: Hitachi] An SPS system plans countermeasures actions for specific accidents on the power network based on online information extracted from SCADA. If an accident actually occurs, the SPS system carries out controls automatically in order to prevent overloads in the power system. Hybrid Battery Energy Storage System (BESS) equipped with lithium-ion and lead-acid batteries for wind power generation [Entrusted company: Hitachi and Hitachi Chemical] The project aims to reduce the total costs of energy storage systems by introducing a hybrid energy storage system. The hybrid energy storage system is intended to achieve both high-performance thanks to the utilization of lithiumion batteries and also cost-effectiveness through applying lead-acid technology. Objective of BESS installation is to demonstrate usage of lithium-ion and leadacid batteries and evaluate possibilities of its wider adoption in the following scope: 1. power system protection against overload on transmission and distribution lines, 2. energy storage in high wind generation conditions and provision of required reserves. Objectives mentioned above include also functionalities such as: 1. curtailment of short-term fluctuations in wind farm output, 2. provision of ancillary services in the scope of frequency regulation for Transmission System Operator, 3. ancillary services similar to those provided by the pumped storage hydropower plants, 4. provision of reserve capacity services, 5. price arbitrage (electric energy time shift). 3. Exploring business models for SPS and BESS [Entrusted companies: Hitachi, Hitachi Chemical and SMBC] Hitachi, Hitachi Chemical and SMBC will verify the advantages of SPS and BESS, and will present business models aimed at their wider adoption.